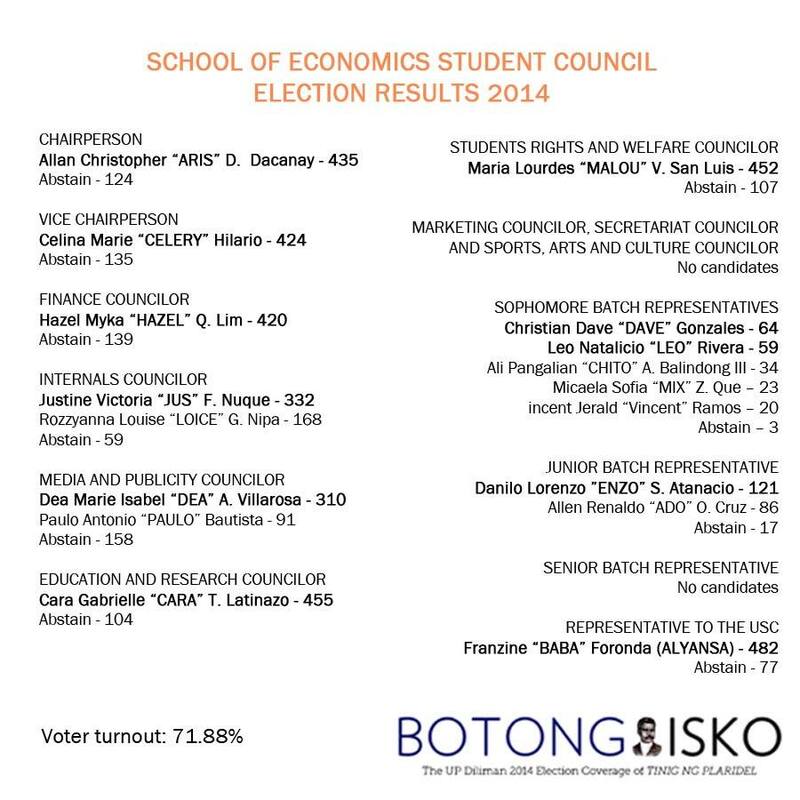 The School of Economics concluded its special elections on March 14, filling the vacant positions of Marketing Councilor, Secretariat Councilor, Sports, Arts and Culture Councilors and Senior Batch Representatives. Unopposed Gelo Atienza won the Marketing Councilor post after garnering 319 votes, winning over 60 abstain votes. For the Secretariat councilor position, Sam Cinco won over Ely Cabelin. Cinco got 210 votes, while Cabelin had 142. There were 27 abstain votes. Godfrey Cabrera is the new Sports, Arts & Culture Councilor after gaining 179 votes over the 132 votes of opponent Nico De La Paz. There were 68 students who abstained. Valla Calzado and Mabel Cortez ran alongside each other and were elected as Senior Batch Representatives. They had 92 and 90 votes, respectively. There were 13 abstain votes. A total of 380 out 779 students voted, a 48.88 percent turnout. This fell short of the 390 voters required to make it a successful election with a 50 percent voter turnout. However, the School of Economics Electoral Board (SEEB) decided to adjust this by offsetting the 10 lacking votes as votes against every candidate. All candidates to the local student council were independent. Last February 27, unopposed candidates Allan Christopher Dacanay and Celina Hilario won the positions of Chairperson and Vice Chairperson, respectively. Franzine Foronda is the new School of Economics Representative to the University Student Council after gaining 482 votes against 77 abstain votes. Foronda was the lone candidate running under a party, which was UP Alyansa ng mga Mag-aaral para sa Panlipunang Katwiran at Kaunlaran (ALYANSA). As voting closed at 7:30 pm, 560 out of a total voting population of 779 students had cast their votes, yielding a voter turnout of 71.88 percent.